LATE BREAKING NEWS: POPGUN 3 Won An Eisner! Posted on August 26, 2010 by D.J. 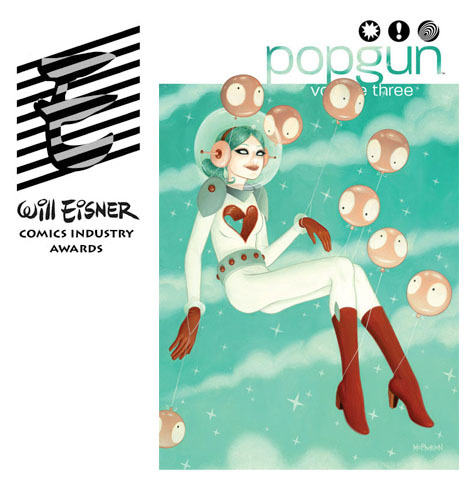 It happened a little over month ago, but I still have a smile on my face… At the 2010 San Diego Comic-Con, POPGUN 3 won the Eisner Award for Best Anthology. I said in my happily shocked acceptance speech that everyone who worked on the book basically won about 1/80th of an Eisner — but it was more like 1/95th! Holy smokes. Alison Acton, Joshua Agerstrand, Laura Allred, Anjin Anhut, Kris Anka, Amanda Becker, Peter Bergting, Patricio Betteo, Danilo Beyruth, Sam Bosma, Dan Brereton, Olaf Brill, Dennis Brown, Antonio Campo, Dominique Carrier, Celor, Jim Charalampidis, Bobby Clark, Ryan Cody, Dave Collinson, Dave Curd, Tim Daniel, Mike Dawson, Ben DeRosa, Michael Dialynas, JEIK Dion, Juan Doe, Becky Dreistadt, Nathan Edmondson, Ulises Farinas, Ray Fawkes, Gary Fields, Frank Gibson, Vassilis Gogtzilas, Zac Gorman, George Gousis, Paul Grist, Scott Hallett, Jason Hanley, David Hopkins, Jason Ibarra, Joëlle Jones, Joe Keatinge, Janet Kim, Nic Klein, Peter Krause, Edward Kwong, Erik Larsen, Robbie Lawrence, Johann “Ullcer” Leroux, Maximo V. Lorenzo, Thomas Mauer, Dylan McCrae of SatteliteSoda.com, Derek McCulloch, Sam McKenzie, Tara McPherson, Alberto Mielgo, Robb Mommaerts, Paul Montgomery, Chris Moreno, Matt Moylan, Ralph Niese, Anthony Nixon, Josh Parpan, Jeff Powell, Isam Prado, Justin Randall, Stephen Reedy, Jamie S. Rich, Rachelle Rosenberg, David Rubin, Matteo Scalera, Douglas E. Sherwood, Guillaume Singelin, Eric Skillman, ericstephenson, Alisa Stern, Amy Stern, Chris Stevens, Frank Stockton, Andre Szymanowicz, Gregory Titus, Ron Turner, Christian Ward, Daniel Warner, Connor Willumsen, Brian Winkeler, Michael Woods, Derek Yu, K.I. Zachopoulos, Tonci Zonji, Jim Zubkavich, and the fine folks at Image Comics. I’m so proud to have had the opportunity to work with all of you on the book! This morning, my alarm went off at 6:45 AM, as I’d set it. It went off again at 7:00 AM, as I’d also set it. As I was typing the first sentence of this post, it went off again at 7:45 AM, as I think I set it after not wanting to get up at 7:00 AM. Sometimes I wonder if the main reason for the hate is the SOUND. I hate the SOUND of my alarm. And I’m on the third sound in two days. And I loathe them all. At least at 6:45 – 7:45 in the morning. Maybe it’s not the fault of these cheesy factory set ringtones and melodies. I bet I could download a song or some funny whatsit or whathaveyou, but I don’t want to spend money on this. Bah. The truth probably is that I could download the most awesome of awesome (“Blaze of Glory” by Bon Jovi in case you didn’t know), and I’d end up hating it as much as any of these ringtones and melodies just because it’d become what rustles me from my slumber every day to go to the cubicle mines.